Electrophysiological studies are performed to record and analyze intracardiac electrograms (EGMs). Different catheter types are inserted via venous access and placed at distinctive locations in the heart. For spatial mapping, circular mapping catheters are often inserted into the atria. There are interesting parameters that can be quantitatively determined from cardiac mapping data, especially the local wave direction and conduction velocity (CV). These parameters can aid in the understanding of the arrhythmia pattern and possible substrate changes. In this project, quantitative analysis techniques were developed to determine these parameters from single excitation wavefronts measured with such catheters. Furthermore, intracardiac EGMs were simulated by modeling measurement catheters in realistic atrial geometries. Electrograms measured with circular mapping catheters are analyzed using a cosine-fit method. It determines the incidence angle and the CV of each wave front. In a simulation study, the method could clearly distinguish between ectopic foci in different pulmonary veins. In clinical EGMs, resulting incidence angles pointed towards the stimuli positions in the coronary sinus. 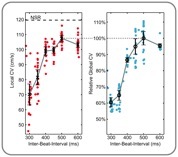 Data measured during incremental pacing could be used to determine CV restitution. Data from other catheter types or colliding wavefronts could be analyzed using an interpolation of the local activation times. The combination of simulation and analysis of intracardiac EGMs helps to determine parameters for personalized simulations, develop new analysis techniques that support the physicians during electrophysiological studies, improve catheter design, and to gain better understanding of atrial arrhythmias.